Mòsì Firenze kohteessa Firenze, Italia: Varaa nyt! 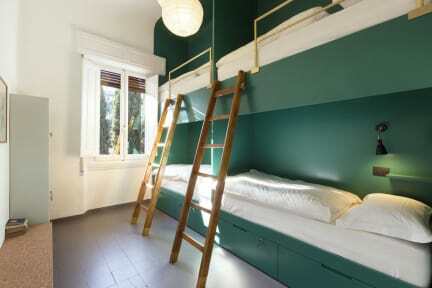 Mòsì is a new kind of bed&breakfast. Is a place that brings together the comfort and sense of familiarity of a B&B with a hostel is social and laid back atmosphere. The attention to detail in furnishings; the homemade Italian breakfasts; the sense of community in the common spaces, the warm, smiling faces; my goal is to constantly seek out new events and activities to share with my guests and create a sense of community. Mòsì-a place where travellers are welcome and experiences can be shared. The places that we love most are shared with everyone: guests and friends. Mòsì is situated within an elegant turn-of-the-century Art Noveau villa that has stayed true to its style over time. Everything is as it was in the past: the original decor on the walls, the flooring and authentic Italian vintage furnishings...all with fresh, contemporary touches. Every room is decorated with the utmost attention to detail, making each room unique and welcoming. At Mòsì there is a lot to discover: the cheerful Kitchen that looks out on the garden, an ideal place to relax on our hammock and watch the sunset while sipping a glass of wine. 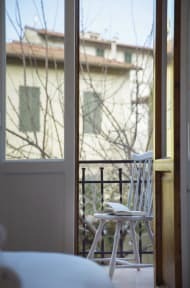 The Thinking Room, with its collection of Human Rights books or the Living Room/Study where you can read, work, look through photos of your trip or even play the guitar! -We offer very comfortable rooms and beds, rooms are all with air-conditioning and heatings. -Kitchen: microwave, cattle, fridge and plates. Please note that you can't use the stoves, so you cannot properly cook. -Common areas: WI-fi, sofa, patio and a nice garden with tables and hammock. -Free coffee and tea, and amazing BREAKFAST included. -Luggage storage: free on the day of the check-in, also free for the check out (but ask the staff for the time). - Wi-fi in the common areas and in the rooms. -Laundry service: not included in the room price (12 euros), wash and dry.